If you are in the market for a new garage heater, then look to the qualified experts at DESCO Services. 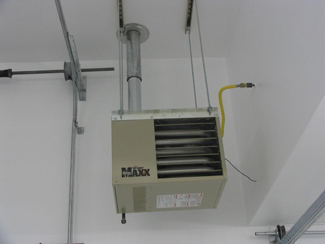 Our technicians can repair or install any brand of garage heater. We primarily install Modine heaters but can provide you with any brand you choose. There are plenty of options available when it comes to selecting your next shop heater. Units can be direct vented so that fresh air is being pulled from the outside. This direct venting is widely utilized by shops that are using combustibles and concerned with actually damaging a heat exchanger. It is also utilized by shops that have issues with flammability. Whether it is an electrical garage heater or natural gas garage heater, there are two types of options when it comes to shop heaters. The unit generally hangs from one ceiling corner and just heats the room. It is used typically to heat any size garage. Excellent option in garages with higher ceilings. Can provide a savings of up to 30% when compared to a typical shop heater. Different sizes are available and can run up through 95% efficiency. Can provide stability to heating costs. Needs minimal maintenance of system. When you spend the cold days of winter working in a shop or garage, it is important to have the reliability of a quality heating unit. At DESCO Services, we can install or repair whatever kind of shop heater keeps you warm. If you are looking to repair or install any kind of electric garage heaters or a propane garage heater, call one of our customer service associates at 717-846-3384 or 717-637-2216 or 717-337-3053. We serve most Central PA including York, Hanover and Gettysburg PA. We will get you the help you need and keep the chill of winter out of your shop or garage.